“We honestly didn’t even know Beaumaris existed…it was purely chance,” Jackie recalls of her serendipitous encounter with the neighborhood. Jackie and Michael worked closely with Sandy Frisco of Frisco Construction to create their ideal home. While it took several years to decide on a design and layout within budget, the actual remodel lasted only 10 months. “We really wanted to live in the space and work out how it would grow with us before we committed to anything,” Jackie says. Another example of indoor/outdoor living, the lounge room can easily be accessed through large glass doors. One of the first projects completed upon move-in was installation of luxurious, olive green, New Zealand wool carpet—much more conducive to life with children than the white tiling they inherited from the previous owners. 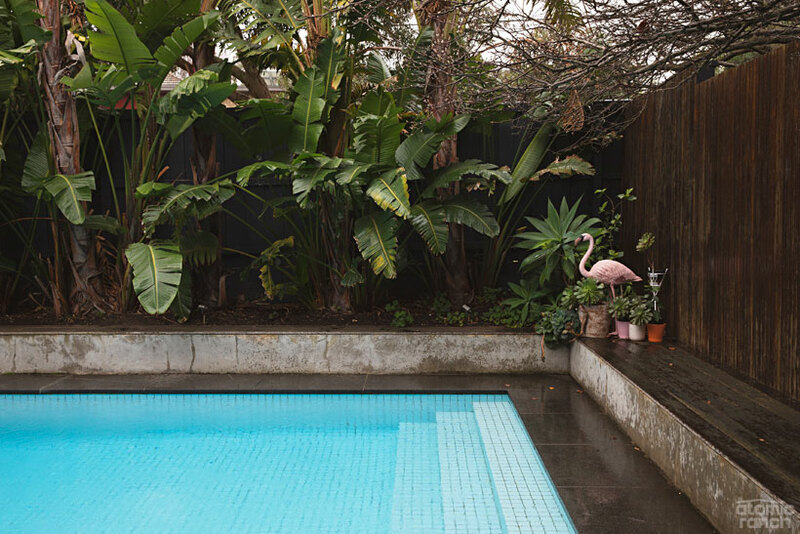 To accommodate life before the large remodel, they added a pool to the front courtyard, which acted as an extra living space before tackling a new addition. The pool is a little oasis, complete with a flamingo figurine. Despite the original fireplace and a gas heater fitted during a 1990s remodel, the winters were very cold. 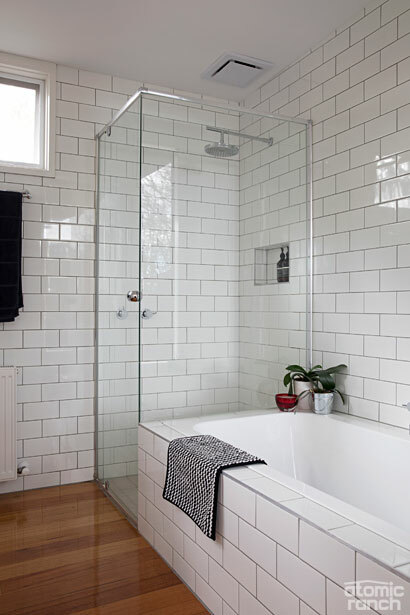 Hydronic heating was retrofitted into the original areas of the home and installed into the newly built parts of the renovation for a cozy year-round home. Besides the home’s lack of heating, there were no serious structural or internal issues to tackle. “We were very lucky that most of the original features were still intact,” Jackie says of the beautiful narrow chimney brick, stairs and living room layout. Working with Sandy, they kept the original woodwork, floorboards and exposed brick—then mimicked the design in the new areas. 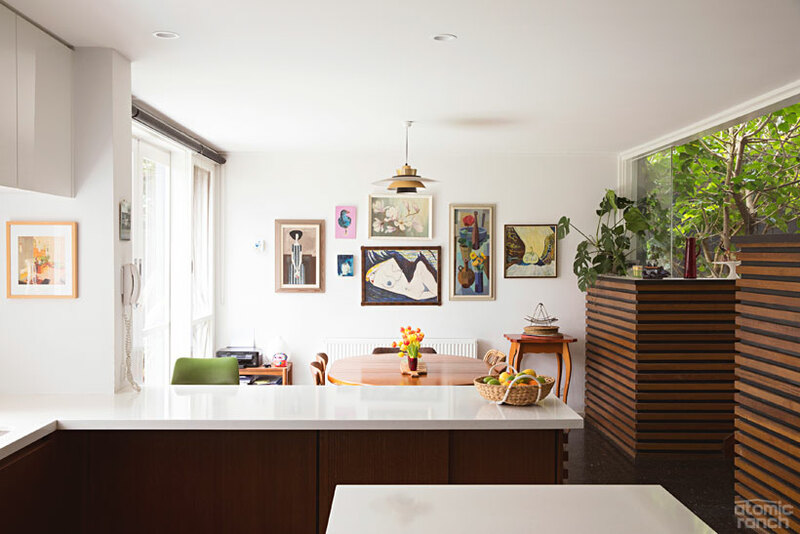 White Caesarstone countertops give the kitchen a clean look and contrasts well with the gallery wall. 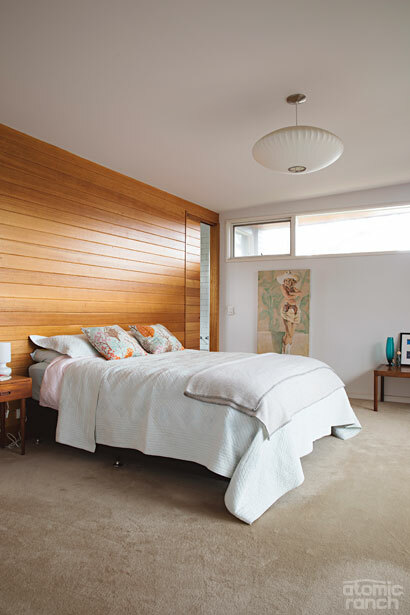 Part of the second story addition, the master bedroom matched the Tasmanian oak wall from the lounge room and an ensuite bathroom can be accessed through a sliding door. “Our builder [Sandy Frisco] just managed this for us…. We told him what we wanted and sourced the taps and fixtures ourselves and handed it over,” Jackie recalls of the master bathroom. living room. Converting a wall to a countertop not only connected the dining room to the kitchen area but also created a lighter and more airy space. “We worked hard to make it functional but also to have some feeling that, with the materials and the styling and the open feeling, it could have been built this way originally,” Jackie explains. home’s intrinsic midcentury aesthetic. Large windows in the new living room and master bedroom were modeled after existing ones but used a safer and more environmentally-friendly glass. 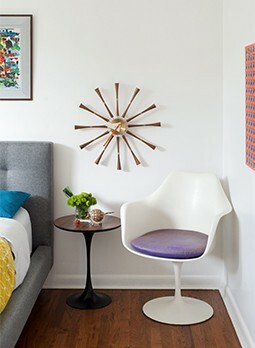 “A lot of the furniture in the house are secondhand finds—some I literally picked up off the street—that have been reupholstered or revamped in some way,” Jackie describes of the eclectic yet flowing interior design. Some of her treasures include a Chinese screen from Singapore, a pool table from her childhood, a side table handmade by her father, and a purple cracked vinyl sectional from the 1970s that was glamorously reupholstered. 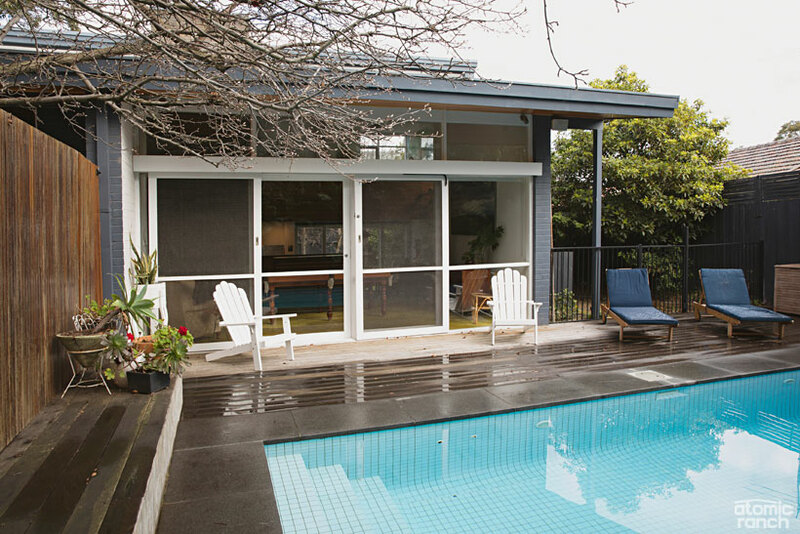 Now a local committee member, Jackie works with Beaumaris Modern to protect midcentury houses in the area from demolition. To learn more, visit beaumarismodern.com.au. To peek inside more homes and learn about your favorite era’s designers, stay tuned for Atomic Ranch’s forthcoming special, The Design Issue.